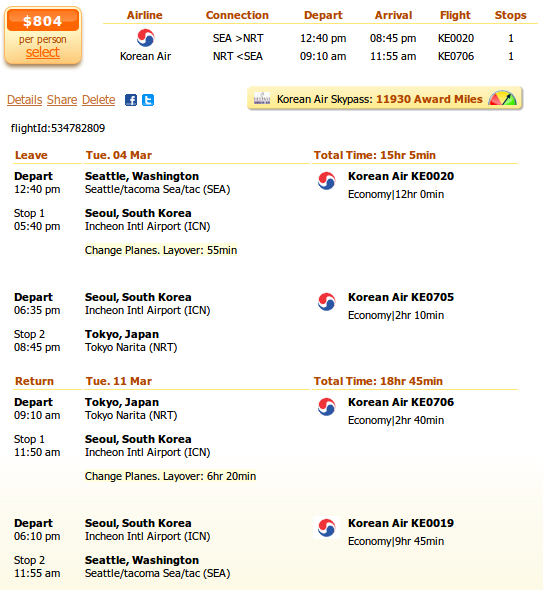 Our editors are always busy trying to find cheap flights and this time the winner is Tokyo with cheap Korean Air airfares from Seattle – Tacoma International Airport (IATA code: SEA) to Narita International Airport (IATA code: NRT) from $804 r/t. Depart on March 4 and return on March 11, 2014 and you save over 10% compared to the next cheapest airline. Search for this Tokyo flight before it sells out and book it right away. Compare the prices of 3-4 different providers to find the best rate, but keep in mind that we have found this is an Expedia offer we have found on Travelgrove. Take a look at the deal details on the below screenshot. You should keep in mind that this cheap flight has got a stop in Seoul, South Korea each way. During the departure flight layover time is 55 minutes only, so your schedule will be a little tight. For this Seattle to Tokyo airfare with Korean Air, Korean Air Skypass, the frequent flyer program of the airline will give you 11,930 award miles – nearly 15 mile for every dollar spent. As with Korean Air you need about 70,000 award miles to get a free flight to North America, booking this flight will bring you 17% of the necessary frequent flyer miles! Korean Air allows you to take one carry-on baggage with you to the plane for free (mo more than 12 kg/25 lbs) and 115x115x115 cm/ 45x45x45 ins. Passengers on economy class are also allowed checked baggages under 23 kg/50 lbs for free! This entry was posted on Monday, January 13th, 2014 at 6:00 am and is filed under Airfare Deals. You can follow any responses to this entry through the RSS 2.0 feed. You can leave a response, or trackback from your own site.